When sixteen year old Arcadia "Cady" Day wakes in a hospital after experiencing what can only be called a psychic episode, she finds her family in tatters. With her twin sister gone, her dad moved out, her mom's spiraling depression and her sister's boyfriend, Cane, barely able to look at her, the only bright spot in her life is Bryan Sullivan, the new guy in school. When Bryan's around, Cady can almost pretend she's a regular girl, living a regular life; when he's not, she's wracked with wild, inexplicable mood swings. Would you listen to Arcadia's Gift again? Why? I would as a preparation for listening to the next in the series. The narration is strong enough to enhance an already excellent story. What other book might you compare Arcadia's Gift to and why? Ashfall by Mike Mullins. Though not a paranormal and the boy is the protagonist, it gives an insight into what a teen is capable of when put in an unreal situation. How they deal with the unexpected. Which character – as performed by Ashlyn Selich – was your favorite? Though not in audio yet, the second book takes her story a very different direction and is an excellent evolution to the story. 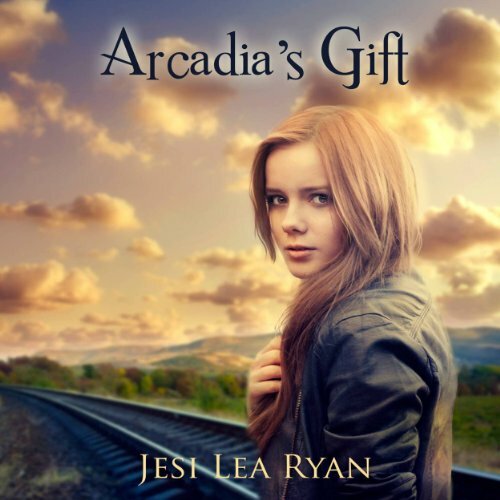 I received a review copy of the audiobook of Arcadia's Gift from the author. I was in no other way compensated for my review, though I have been following her on Twitter for years. I was glad for the chance to listen to this book, and relieved I liked it so well. Arcadia's Gift is about half of a pair of twins, Arcadia (Cady) Day, and what happens to her when her sister Avalon (Lonnie) is taken from her in a terrible accident. She experiences Lonnie's death with her, which puts her into deep shock. Then, as she's getting her life back together, bonding with a boy who's helping her through her grief, she learns something has happened to her to complicate her recovery. One might think a book about grief would drag, but this book isn't entirely about grief. It does handle the subject well. The book is about hope, and love, and what happens next. Cady is drawn very believably. She's a teenage girl, flaws and all, and the text never excuses her mistakes. Everyone around her wants to go easy on her because of her grief, but she holds herself to a higher standard. She also experiences her grief in very real ways. She wants to stop hurting, but she fears leaving her sister behind. She wants to move on with her life, but then she feels guilty for feeling happy or carefree. She sympathizes with the classmates who miss her sister, but she grows infuriated by the stark reminder of her loss in the memorial left at her sister's locker. The push-and-pull of emotions is relatable to anyone who's ever lost someone close. Her relationship with Bryan Sullivan, too, develops in a very real way. At first, he reaches out because he knows what she's going through, and he wants to give her the support he needed when he went through something similar. There was already some attraction there, but his kindness and compassion make him easy to like. He, meanwhile, sees her strength and caring firsthand. Their feelings develop realistically, over a period of time. There is definitely a place for this book on YA shelves. I know a lot of people who bemoan the lack of heroines whose strength lies in their compassion, whose conflicts aren't resolved by beating someone up (or getting their boyfriends to do it). The story never lacks for tension, but the conflict depends on Cady's inner strength. I had expected the climax to kick off from someone trying to hurt her, but I was pleasantly surprised. This book stands well on its own, though it leaves plenty of unanswered questions for a second book. I know I care about the characters enough to want to keep reading. Arcadia's Gift is self-published, but it doesn't read like a self-published book. It's far more polished than I've come to expect from nontraditional publications. There are places where the wording seems a little clumsy or overdone, and Cady sometimes slips into a more adult voice. I would've liked to have seen more done with her two closest friends, who vanish for the last few chapters. Overall, though, it could've passed for any traditionally published YA, if I hadn't known ahead of time it was self-published. The audio edition, too, is very professionally done. I couldn't have distinguished it from any other Audible production. The sound quality is clean, and Ashlyn Selich was an excellent choice of narrator. She captures Cady's vulnerability and confusion, and she sounds the part of a teenage girl. There wasn't a lot of variety of accents, but she was able to modulate her tone so that I could follow who was speaking without difficulty. If all authors put this much work into presenting their finished products outside traditional publication, I would read a lot more self-published books. If you could sum up Arcadia's Gift in three words, what would they be? The sweet love story between Arcadia and Bryan, and their connection. The grief of the family and how everyone deals with it, and the characters given close and distant at the same time. Arcadia's 'gift' and the beauty of it. What aspect of Ashlyn Selich’s performance would you have changed? She is very sweet, her voice is beautiful but she reads so quickly and as a result the flow of the story gets lost in some parts and most of the emotions aren't well given. In my opinion the way of reading should be much slower. I've already have the second one can't wait to see what's going to happen.